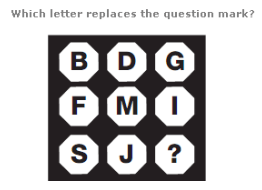 Look at the images below and choose which letter is missing. 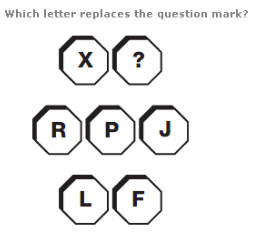 These tests are meant to practice your reasoning skills by finding out what is missing. Taking pairs of letters in the inner and outer segments of each eighth of the diagram, the numerical values always add up to 20. 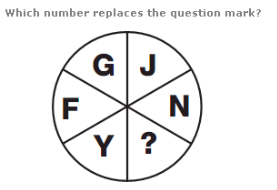 Starting with the G, move clockwise around the circle, in steps of 3 letters, then 4, 5, 6 and 7. 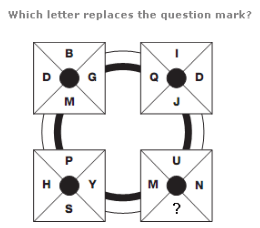 Starting with the top segment of the top left square and moving clockwise around the other 3 squares, letters move through the alphabet in steps of 2, with the positions moving one place clockwise each time. Letters in the next segment of the top left square follow the same pattern, in steps of 3 letters etc. 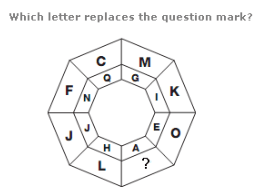 Starting with the bottom right letter and moving in a clockwise spiral around the diagram towards the centre, letters advance through the alphabet six letters at a time.